What’s that social media app all the millennials in your office are talking about? You know, the one where you receive a picture and frantically try to absorb it all in 10 seconds before it disappears into oblivion? This handy app is called Snapchat and it’s become a bit of a phenomenon. Forget the old days of clogging up your text message inbox with random pictures you received from a friend, and forget about having to email photos because they’re too large to send via text…you can now send photos quickly and efficiently through Snapchat. And thankfully this app has made some improvements recently that now allow you more time for viewing before the picture or video disappears into that black void in cyberspace. To make snapping even more fun, Snapchat has a variety of filters, text options, drawing tools, and stickers that help you create funny and more personal photos. We’re so excited that for the UGM this year, we’re rolling out with our own UGM Snapchat page! We’ll be taking plenty of photos and videos at the 2018 UGM, and wanted to find the perfect way to share them with you. Now you can catch up on all the UGM happenings between classes, at the party, or even when you’re too excited to sleep at night. We’re not stopping there though! We’ve also designed several geofilters to use while you’re there, so when you snap all your friends back home, they can be jealous of all the fun you’re having at the UGM. We even have a festive Pirates in Paradise filter to go with your amazing party costume on Thursday! Getting in on the Snapchat party is easy. 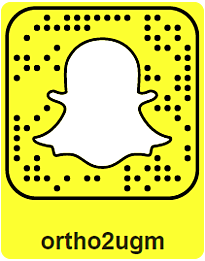 All you have to do is take a picture of our Snapcode included right here.Then open Snapchat, click on the ghost in the top left corner, and select add new friend. From here, select add by snapcode, and when Snapchat opens your photo gallery, you can choose the picture of our snapcode. You can also search us by our username – Ortho2UGM. It’s as easy as that! We know you’ll be busy learning a lot and making new friends at the UGM, but we also hope you include us in on all your favorite moments. Whether you’re posting photos to Facebook, Twitter, or Instagram, be sure to use the hashtag #O2UGM18. This will allow us to see what your favorite moments of the UGM have been, and help us plan for next year!